Cabbage has a long history of use both as a food and medicine. Cabbage was grown in Ancient Greek and Roman civilizations that held this vegetable in high regard as a general panacea capable of treating a host of health conditions. While it’s unclear when and where the headed cabbage that we know today was developed, cultivation of cabbage spread across northern Europe into Germany, Poland and Russia, where it became a very popular vegetable in local food cultures. Sauerkraut, a dish made from fermented cabbage, has a colourful legacy. Dutch sailors consumed it during extended exploration voyages to prevent scurvy. There are three major types of cabbage: green, red and Savoy. The colour of green cabbage ranges from pale to dark green while red cabbage has leaves that are either crimson or purple with white veins running through. Both green and red cabbage have smooth textured leaves. The leaves of Savoy cabbage are more ruffled and yellowish-green in colour. Red and green cabbage have a more defined taste and crunchy texture as compared to Savoy cabbage’s more delicate nature. In the kitchen, cabbage should become a dietary staple. It’s inexpensive, easy to prepare and keeps well. Cabbage is an excellent source of Vitamin C. This versatile vegetable delivers dietary fiber, carbohydrates, calcium and iron. Just a three ounce serving contains about 25 calories. Although some if its benefits are lost in cooking, studies show Cabbage is a cancer fighter, especially for stomach, colon and breast cancers. Having strong antiviral and antibacterial properties, Cabbage has also been reported to be a helpful remedy for the treatment of ulcers. Keep cabbage cold. This helps it retain its vitamin C content. 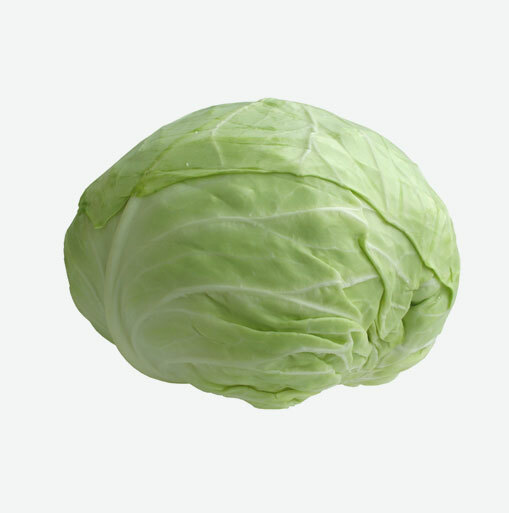 Place the whole head of cabbage in a plastic bag and store in the refrigerator. Once the head has been cut, place the remainder in tightly sealed plastic bags and refrigerate. Try to use the remaining cabbage in the next day or two. Do not wash cabbage until you are ready to use it. Avoid slicing or shredding cabbage in advance. This will cause it to lose some of its vitamin C content. If you must prepare it an hour or more in advance before cooking, place it in a plastic bag, seal tightly, and refrigerate. Cabbage can be steamed, boiled, shredded and enjoyed in a variety of dishes. Soak the cabbage in salt water for about 15 minutes and rinse well afterwards. Shredded cabbage, diced apples, shredded carrots and some walnuts drizzled with a vinaigrette dressing makes a healthy, delicious salad. Cut cabbage into bite size pieces and toss into your soups or stews. Cabbage can also be boiled or steamed and served as a side vegetable with some butter, sea salt and freshly ground black pepper.